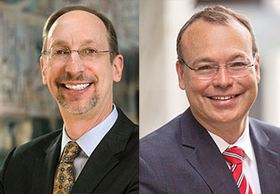 Dr. Jonathan Lewin, left, is president and CEO of Emory Healthcare and Dr. Jeffrey Balser is president and CEO of Vanderbilt University Medical Center. More than 1,800 years ago, the Greek physician Galen observed: "That physician will hardly be thought very careful of the health of his patients if he neglects his own." Galen's insight should be taken to heart by healthcare leaders today. There is growing evidence that the nation's physicians, nurses and other healthcare professionals face a hidden threat to their health in the very workplaces that employ them. A new report from the Blue Ridge Academic Health Group, a study group of academic health center CEOs that has met annually for the past 22 years and which we currently co-chair, finds that addressing this silent epidemic should be one of the highest priorities in our institutions and across the industry. What's at stake is the "joy of work" that the most productive and empathetic clinicians bring to their patients; the sense of professionalism that every doctor, nurse and other health professional has a right to expect; and the satisfaction, quality and safety that is rightfully demanded by patients. The Blue Ridge report makes one of the first systematic attempts to quantify the economic impact of physician burnout, finding it amounts to as much as $150 billion a year, or 4.7% of our nation's annual healthcare expenditures. That figure reflects burnout-driven physician turnover; the productivity loss of early retirements; and the projected cost of burnout-related medical errors. It does not include, however, the total impact of an estimated 300 to 400 physicians who commit suicide annually (according to the American Foundation for Suicide Prevention), representing the equivalent of two to three graduating medical school classes lost each year. In all of these areas, much more research is needed, and we are grateful to acknowledge the important leadership role being played by the National Academy of Medicine's Action Collaborative on Clinician Well-Being and Resilience. The first large-scale study of U.S. physicians, conducted in 2011, found that burnout was more rampant among physicians than in the workforce at large, with 45.5% reporting at least one symptom. A 2014 survey found an even higher rate, of 54.4%, with authors Dr. Tait Shanafelt of the Mayo Clinic (now chief wellness officer for Stanford Medicine) and his colleagues concluding, "More than half of U.S. physicians are now experiencing professional burnout." Ironically, the same forces of accountability and data transparency that we all applaud—including the wholesale move to electronic health records—are some of the forces contributing to physician distress. In particular, the clerical tasks associated with escalating healthcare documentation burdens are a savage application of the law of unintended consequences. Growing demands for productivity and downward pressures on reimbursement are among other factors brought to bear on physicians. We need to de-stigmatize clinicians who ask for help; encourage transparency; empower all members of the care team to be watchful for symptoms, in themselves and others; and focus on system improvement. We support such moves as elevating the role of chief wellness officer in health-system management; rethinking the physical and organizational design of clinic space to co-locate physicians and care teams; and teaching every student, resident and physician to take their own health and wellness needs as seriously as they do those of their patients. After all, neither we nor our patients can afford to lose so many of those who have invested so much to serve as our healers, and on whom we so strongly depend. Interested in submitting a Guest Expert op-ed? View guidelines at modernhealthcare.com/op-ed. Send drafts to Assistant Managing Editor David May at [email protected].